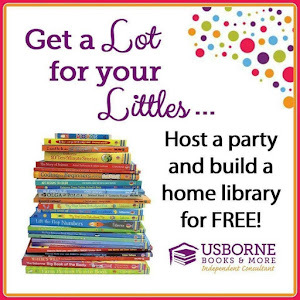 When you have 2 preschoolers and a baby at home, safe, entertaining activities are a must! Condensed Milk Paint is definitely both of those. Notice I didn't say clean. While clean activities are wonderful, this is not one of them. If you have ever used condensed milk for anything you know it is thick and very sticky! So while this is a really straightforward activity it is a very sticky one as well! 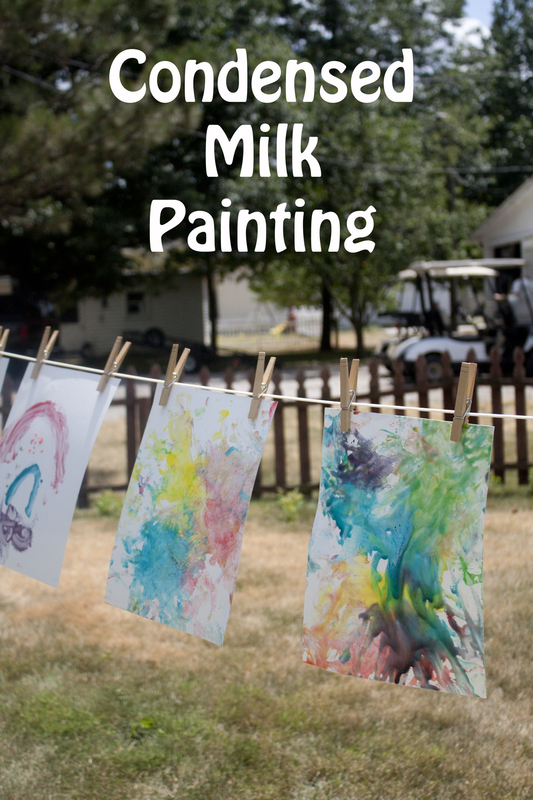 To make the paint all you have to do is mix the condensed milk with the food coloring. Easy Peasy. I chose to mix our paint in an ice cube tray. I added milk to a few sections being sure to leave empty sections for mixing; my kids love mixing. Then I added red, yellow, and blue food coloring to a couple of spots in each tray. I mixed the colors into the condensed milk with toothpicks and handed them to the girls to paint with. Again we used watercolor paper since it is much thicker than normal paper and holds up better to such thick paint. ...and mixing all the colors. 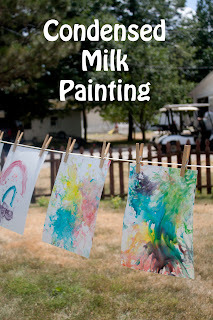 Mixing colors is one of those hands-on art activities that kids love (especially if you make it messy), and it can be used to teach primary, secondary, and even tertiary colors (if your kids are up to it). Mine were not, but since we started with primary colors we did talk about those and reviewed which primary colors mix to get which secondary colors. 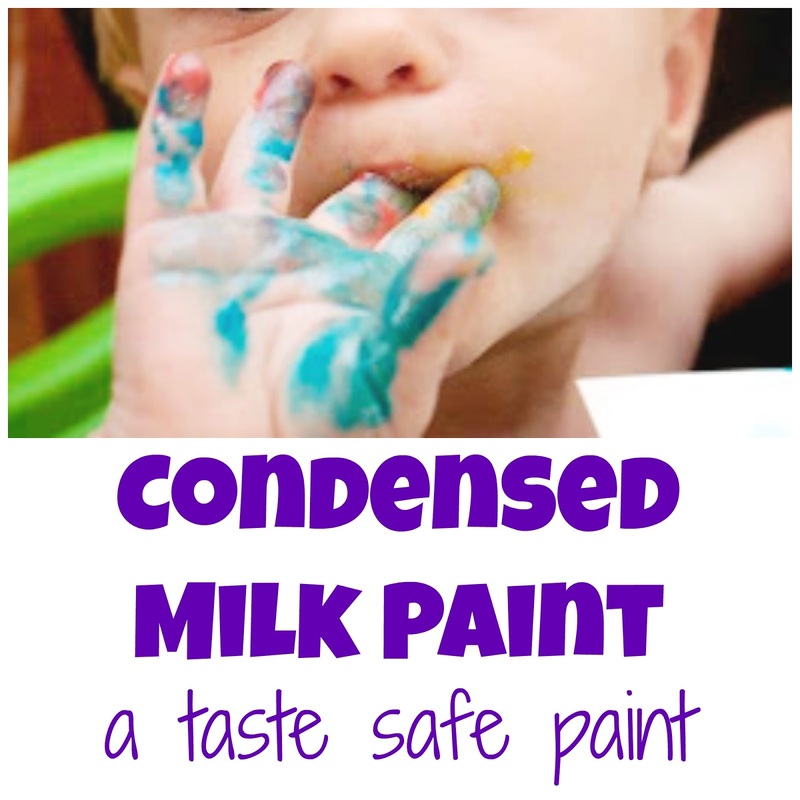 The best part about painting with condensed milk is that it is taste safe, so even babies can use it to paint. The bad part about painting with condensed milk is that it actually tastes pretty sweet, so the kids may want to eat it more than paint with it. I know I mentioned before that it was sticky, and by the end of our painting session so was he. 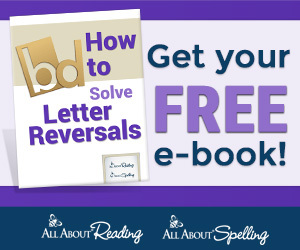 It's a good idea to make sure you leave enough time for a bath after this activity! Luckily, once the condensed milk paint dries it isn't really sticky anymore, but it does stay shiny! Our condensed milk paint was amazing for safely entertaining preschoolers and a baby even if it did mean an extra bath. Needing more taste safe activities? Try Spice Painting or Scented Play-doh!